France, Northwestern. Title-cartouche with list of the départements 1-20 as well as miles indicator. Regional map after Friedrich Wilhelm Streit (Ronneburg, Thuringia, 1772 – Berlin 1839) drawn by W. v. Möllendorf. Steel engraving colored in outline for Natorff & Cp., Berlin. (1833/37.) 9 × 11 in (22.8 × 28.1 cm). From Streit’s 4-sheet set of France. 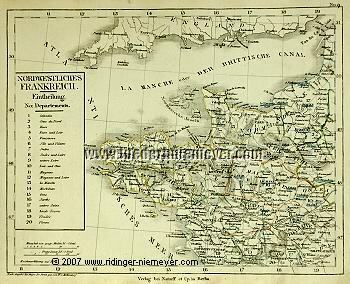 – Up to Calais – Boulogne – Rambouilles – Chartres – Chateauroux – Poitiers – Les Sables-d’Olonne – Île d’Ouessant . South England from Landsend to Dover. – With designation of i. a. anchor places and lighthouses.